When you watch Night Train, be sure to look for the portable White Radio. It makes its appearance early on as the people board the train for what will be the ride of their lives (or so we’re told). You won’t have to look too closely because director Jerzy Kawalerowicz went out of his way to rub your nose in it. The camera zooms in on the White Radio and then holds the shot for a loving close-up any leading lady would give her eye teeth for. “This has got to be important,” you say to yourself. We know from the box art that there is a murderer on board the train. So the White Radio must play an important part in the story. Maybe the lady carrying the radio hears that a murderer is on the train and she’s the only one who knows? Better yet, maybe all communication to the train is out and the only way to warn everyone is through the radio. But there’s a storm and the signal keeps coming in and out and a complete description of the murderer can’t be received. He’s a man... a middle aged man.... wearing a grey suit... and he’s... sitting RIGHT NEXT TO YOU! Sadly, that’s the hypothetical American version of Night Train, and not this, the 1959 Polish one. Here the White Radio is quickly forgotten, a tip-of-the-hat to one of Alfred Hitchcock’s McGuffins. Instead we get a period mystery piece rambling up and down the corridors of a train on an all-night run to the coast. The mystery seems to be decoding what exactly, if anything, happens. The train is filled with a diverse load of passengers hijacked from an Agatha Christie novel. There is the lawyer and his cheating wife, the young priest, the sleazeball on the make for the lawyer’s wife, the guy that survived a concentration camp. They are all in the first class sleeper car. Back in second class, the coach compartments are packed with people without names. The first person we really meet is Mr. Obvious Killer aka ‘Jerzy’ (Leon Niemczyk) who is made to jump through the hoops of suspicion until anyone who’s been paying attention will know that he’s not the guy on the lam for murdering his wife. That’s alright because you know that Jerzy is going to be involved some way in catching the killer. Into Jerzy’s life and sleeping compartment is thrust Marta (Lucyna Winnicka). Unlike Jerzy, she’s clearly up to something... but what? And there’s a guy following her whom she wants nothing to do with (OK, now we’re getting somewhere). For some reason, Jerzy is willing to let Marta crash in his private sleeper compartment rather than call the train’s cop (called a ‘Controller’... now that’s scary) to have her kicked out. Is Jerzy hiding something... like murder? Of course not. We all know he’s not been in the running for a while now. 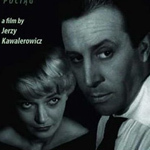 Perhaps Kawalerowicz is pushing the inaction into Jerzy’s claustrophobic sleeper as another Hitchcock device? Maybe this is Cary Grant’s train ride in North by Northwest. But no, in that film we knew somebody was chasing him. Perhaps sparks will fly between Jerzy and Marta in the close quarters? She’s got a look that says she’s hiding a big secret... or maybe she’s just nearsighted. By this time I’m starting to get impatient with the film ... when’s the White Radio going to reappear? Eventually the guy who’s trailing Marta peels himself away from the rest of the sardines in coach and tries to make his way up to first class. But he doesn’t have the E-Ticket he needs and is stopped by the conductress. Instead, drawing on that good old Polish fortitude, he recklessly climbs outside the train and, by hanging precariously onto the window, gets to have a chat with Marta, who has gone to the back of the car for something or another. Turns out the guy is her old boyfriend (at least in his mind), and we get the sense that she’s got the right idea to dump him for being a pest. Did he murder his wife to be with Marta? Possibly, but that’s probably a long shot. She tells him to buzz off, though not before giving him one of her long soulful stares. Then she goes back to Jerzy’s sleeper for some low level verbal sparring. The train makes an unscheduled stop to pick up three uniformed cops who know the murderer is on the train. They just don’t know who he is. Somehow they do know what compartment the killer is in and it’s Jerzy’s. The cops get to the compartment and guess what?... Jerzy doesn’t have his ID papers with him. So putting two and two together and getting five, the cops drag Jerzy off while everyone else watches. Anyway, she goes tearing back into second class to look for the killer, finds him, and it’s just some guy. We don’t know who the hell he is! He runs to the end of the train, pulls the emergency handle and takes off across a farm field. All the able-bodied men on the train chase after him and run him down in a graveyard. There’s a moment when it looks like they may have killed him, but he’s just fainted. The cops cuff him and take him away. Incredibly, the movie keeps on going! We’re riding this baby all the way to dawn and the coast. There’s a hint that Jerzy and Marta get it on and that Marta might still have a secret or two. Did she know the killer and ratted him out to save Jerzy? Maybe; the movie never says. In one final plot twist (well, more of a kink) we find out that Jerzy is a surgeon and that he is married. Marta gets another one of her thousand-yard stares. The ex-boyfriend finally gets the message and is left slack-jawed and heartbroken at one of the trains stops. At the end of the line Jerzy and Marta get off and go their separate ways. There’s still the vibe that Marta had something to do with the murder. Or maybe not. She walks off into the dunes to some cool 1959 bluesy Polish jazz and we watch a protracted sequence of the empty cars rolling by the camera. The shot ends on an vacant sleeper compartment and just when you expect to see the White Radio, there is nothing! Boy, those surprise endings always get me. None but this was a screener. There are to be director notes in the final product. Hopefully they will address the big gap between audience expectations and what the film actually delivers. The picture is grainy and scratchy. I really felt like I was watching a 45 year old foreign film. The subtitles have some odd spelling and at times are out of sync with the speakers, sometimes comically so. The soundtrack might have been equally embarrassing 30 years ago, but is strangely cool today. If you decide to watch it, don’t worry about the mystery, but rather enjoy if for the artifact that it is. And definitely read those liner notes, and let me know what I missed.